Let’s face it, we all fear the unknown. Fear is natural reaction that keeps us safe and out from bad situations. It’s also what keeps us from making changes, embracing our ambition, and being our best selves. For those last two people, and several others, it was fear that initially held them back. Once they were able to get beyond that fear and actually give it a go, they discovered what trail running really is—life changing. This doesn’t just apply to trail running. For the longest time, it was fear of the unknown that kept me in a job I was itching to get out of, and fear that kept me living in a city too big for what my wife and I wanted. Once we were able to let go of that fear, however, we were free to take the chances and make the moves we had been dreaming of for years. In my experience the key to letting go of fear is a mixture of removing obstacles, preparing as best you can, and just closing your eyes to take a leap. I could talk about this general concept for days, but today I want to focus on trail running. After all, this is a blog about running, not quitting your job and moving away from all your friends. 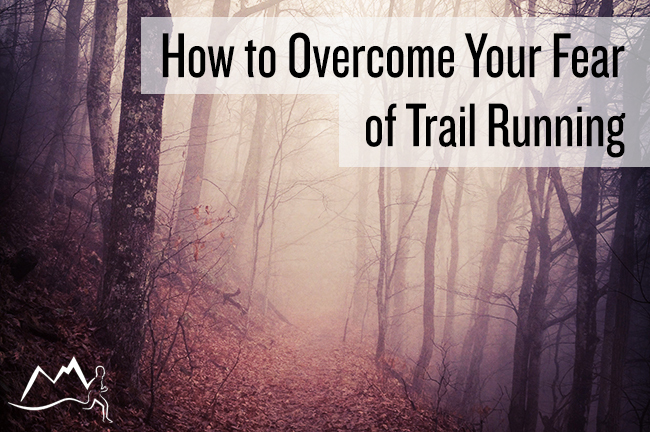 For runners, there can be a lot of obstacles standing in the way of you and the trailhead. Safety, limited access to trails, and limited equipment, just to name a few. But what I’ve founds is that most of what people believe about those obstacles is simply not true. 1) All trails are rocky and rugged: Simply not true. Trail running can take you on anything from crushed gravel bike paths to yes, rugged mountain scrambles. The vast majority of runners have access to some type of trail a lot less daunting than the bear filled adventures that often come to mind. 2) I’m more likely to get injured on trails: It’s true that trails provide different footing challenges than what is expected on the road, but did you know that trail running can actually help prevent injuries? 3) Trail running is dangerous: I’ll admit, being alone in the woods can get a little scary. Those fears become greater depending on a number of factors. Fortunately, there’s an easy fix to this: Find a partner! I’ve run with guys in their early teens and women over 70. I’ve even run trails with a runner who’s legally blind. The danger most people associate with trail running is often exaggerated. It’s be like calling The Interview a good movie. It’s just not. Part two of getting over your fear is to know what to expect. Running is a sport of unknowns. Do we go minimalist or max cushioned? Do we train with high mileage or high intensity? Why can’t I get rid of this nagging injury? Ask a hundred coaches and you’ll get a hundred answers. Fortunately, there are some truths when it comes to running. Especially trail running. Get to know whatever truths you can as a way of knowing what to expect. 1) Running trails is going to be slower than running roads: When you’re first starting out, run for a length of time, not distance. 2) Trail running is more secluded: For most people this is a major benefit. If that intimidates you at first, find a running partner or club, or frequent the busier parks or routes in your area. 3) Trial running introduces new challenges: Bigger climbs, looser footing, water, mud, downed trees. These are just a few of the new challenges that trail running introduces. Don’t look at them as issues, but instead start looking at them as part of the fun. 4) Trail races are different than road races: The good news is that everyone running them once had the same questions you do, and they’re more than excited to share what they know. We’re a welcoming group, don’t be afraid to ask questions. 5) Trail running works different muscles than road running: Go out for your first trail run, and you’ll know exactly what I’m talking about. The uneven footing, loose dirt, and frequent changes in grade will work different muscles from your toes to your nose (maybe not your nose, but you get the idea). Through trail drills and practice, those muscles get stronger over time, and will make you a better runner both on and off the trail. 6) You will get better and stronger over time: If you’re experienced and comfortable on the road, it’s a big wake up call when you’re suddenly struggling on the trail. The more you run, the more comfortable you’ll feel. It’ll come as no surprise that I love trail running. It’s one of my very favorite things. But that doesn’t mean that a new trail or long outing doesn’t still intimidate me. Just last week I scheduled a 15 mile trip along a ridge about an hour from my home. It looked to be an incredible loop. The night before, however, I backed out. “It’s going to be rainy and too cold,” was my excuse. Really though, I was just intimidated. Which I’m ashamed of. I know better than to let a little fear stand in my way, which is why I’ve rescheduled that trip for next weekend. I’ll be better prepared this time. This time, I’ll get more comfortable with the route. No excuses. 1) Find a partner or group to come along: Especially if they know the trails better than you. 2) Study maps and routes: Having a good idea where you’re going helps a lot. 3) Do the research online: Look for hiking or mountain biking routes if running trails don’t come up. 4) Don’t overlook the resources on Rock Creek Runner: The free Trail Runner’s Cheat Sheet is a great place to start for trail running basics. You can sign up here. Remember the person quoted at the beginning of this article? They too had their concerns and fears. But then they tried it. Now they love it. In life we let fear hold us back from too many great things. Together, let’s not let trail running be one of them. So tell me here in the comments. What is about trail running that’s holding you back? What are you afraid of? Go ahead and put it out there. It might sound like less of a big deal once you do. Great article…thank you Doug. I live in an area where trails are abundant, really more so then roads! And I find myself sticking to the scenic roads! When I did wander off the road and onto a trail for my long run, I got lost! We also have plenty of mountain lions and bears to worry about! To overcome my fear, I registered for an ultra trail run later this summer…now, as I await spring, I am eagerly looking forward to the challenge of hitting the trails for further training. My fear has been replaced by the “dare” to myself to finish and conquer something I’ve never done before! A commitment to doing something bigger than yourself replaces fear of the unknown with a desire to overcome successfully! Thanks again, Doug for the support you give us runners! Hey Dean, I love that! Replacing fear with dare. Very cool. I’m excited you signed up for your first ultra. Let me know how your training goes! I’d love to follow along. It is the craziest thing but my fear of snakes is my biggest hurdle when it comes to trail running. I live in the northeast and we rarely, if ever, come across a dangerous snake… I just don’t like them. Anyway, I am registered for the Cape Cod trail marathon in April so I had better get out there and get over it. Your articles are very motivational, I am so glad a friend shared you with me! !